This report was released in 2012 by the African Biodiversity Network in conjunction with the Institute of Culture & Ecology and the Gaia Foundation. It makes recommendations for securing greater recognition of sacred natuaral sites and territories and outlines the rights of the communities who protect these sites. The aim of the Report is to inform communities, civil society, lawyers and policy makers of the importance of sacred natural sites and territories, and of the many emerging challenges that these sites and communities face. 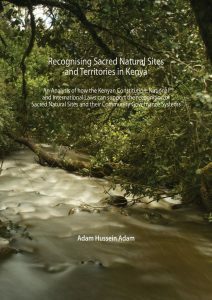 It provides an analysis of how the Kenyan Constitution, National and International Laws can support the recognition of sacred natural sites and their community governance systems. The report, commissioned in 2011 following the enactment of Kenya’s new Constitution in 2010, examines how the Constitution, national and international laws can support the recognition of Sacred Natural Sites and their community governance systems. It makes a number of key recommendations for communities, civil society and Government to strengthen the recognition of, and support for, local Custodians of Sacred Natural Sites and their customary governance systems based on Earth Law principles, which protect these areas. It also explores some of the issues which need to be addressed in the pending Community Land Act.